Wear is described as ‘the phenomenon of metal surfaces that are moving relative to each other getting worn out due to the surfaces scratching each other or due to metallic adhesion’. Wear resistance can be said to be the property in which such a phenomenon is difficult to occur. The properties of wear resistant steels enable them to resist wear, due to rubbing, impact or compressive loads from external agents such as cement, sand, stones etc., and are intended for use in equipment construction and for replacement of wearing parts. Numerous structures, such as dump bodies, materials handling equipment and crushing machines, for instance, are exposed to continuous, abrasive and impact wear, which is costly. As a solution, special structural steels have been developed that are highly resistant to wear and abrasion. There are four main factors which have considerable effect on the wear resistance of steels. These are (i) heat treatment, (ii) alloying additions, (iii) influence of carbon content, and (iv) effects of carbides, both primary and secondary. A big factor affecting wear resistance is ‘hardness’. In general, the wear resistance increases as the material becomes harder. There is a direct relationship between hardness and wear resistance. The resistance of a steel surface against wear is primarily a function of the ‘effective hardness’ resulting from the destructive action of the abrasive particles and depend on the strain hardening rate of the steel under the applied conditions. Factors affecting plastic deformation, such as grain size, recrystallization temperature, hardness, strain rate etc. also affect the wear of steels. Unlike single crystals which have free boundaries, the grains of a polycrystalline steel are influenced by their neighours during deformation, their constraining action on deformation is least when the average grain diameter is greater than the microscopic areas of contact. Thus contact over a large number of grains sharply reduces the wear rate. Hence a large grain size is undesirable for a good wear resistance property of steel. The oxide film produced in air due to mechanical oxidation prevents metal/metal contact and reduces the wear rate as long as the oxide layer remains bonded to the surface. Steels which resist the oxidation effect are more likely to wear by a severe mechanism of adhesion and metal transfer, particularly if they also possess low hardenability. The surface texture of the wear track is greatly influenced by the microstructure of the material. A discontinuous structure is an advantage in oder to inhibit severe grain growth . Thus carbon steels are less prone to wear than the homogeneous stainless steel. Due to ferrite- pearlite structure in C steels the wear is limited to the ferrite constituent only and hence by increasing the carbon, ferrite content can be reduced and the hardness can be increased resulting into increase in the wear reistance. Tempering becomes easy as the amount of carbon increases. If the amount of carbon exceeds 0.6 %, the tempered hardness becomes almost constant. Although when the hardness becomes constant, the wear resistance does not become stable at that point, but the wear resistance increases further as the carbon content increases. When a steel material is tempered, iron and carbon bond together and the material changes into a martensite. This martensite is effective for wear resistance. However, in high carbon steel or high alloy steel, not all the material is converted into martensite by tempering and annealing, and about 20 % to 30 % of the material remains as austenite. This residual austenite is not good for wear resistance. The presence of alloy carbides improves the wear resistance of steels. Hence alloying elements such as chromium, vanadium, tungsten. molybdenum contribute to wear resistance in steels. The carbides being the hardest component in the microstructure has a decisive influence on the wear resistance. Further the smaller is the size of the carbides in the steel, higher will be its wear resistance. There are three principal ways of strengthening the structure of steels by (i) alloying, (ii) heat treating (ii) work hardening. 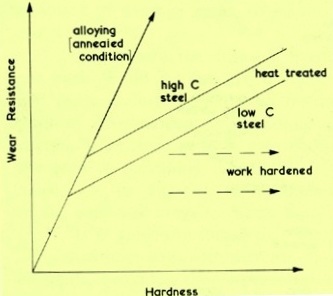 The effect of work hardening on carbon steels on wear resistance is shown in Fig 1. Wear-resistant special structural steels are, as a rule, quenched or quenched and tempered, and have a fine martensitic or martensitic-bainitic microstructure. Quenched and tempered steels are tailored for different applications with sufficient hardness and toughness achieved either by heat treatment process or by thermo mechanical rolling process. The hardness of these steels is tailored to have the required wear resistance along with the needed toughness in an economical way. These steels are produced in thicknesses up to 120 mm. They are produced under the trade names XAR, BRINAR, DILLIDUR, and HARDOX etc. Normalized special structural steel with hardness of 300 HB is now available for structures exposed to low or moderate levels of wear, such as scrap grabs, while the 600 HB grade meets extreme wear resistance requirements. Covering a hardness spectrum from 300 to 600 HB, a suitable material is thus available every type of wear-exposed application. The grade most in use at present is the steel with hardness of 400 HB, which is around five times as durable as conventional structural steel. The steels with 450 HB, a further modified grade, display even higher hardness and, at the same time, good toughness. It enables the realization of more stable and lighter structures that are also highly resistant to impact wear. The main fields of use for the 450 HB steel include the manufacture of dump bodies and cutting edges. All the wear resisting steels contain chromium as an alloying element, which has proven very effective especially in low-acid media. The high strength ensures good shape stability and thus little deformation. Thin-plate structures allowing a greater net load are also possible. The steels have a level of toughness that guarantees a high impact resistance even under the most difficult conditions, such as sub zero temperatures, for example. Wear resisting steels present no problems when subjected to flame, plasma and laser cutting. They display good weldability and low susceptibility to cold cracking. Austenitic manganese (Mn) steel is a very tough and ductile material having high impact toughness. Mn steel is a soft material having an initial hardness of approximately 220 to 240 HB. The wear resistant of Mn steel is based on the work hardening phenomenon. When the surface of Mn steel is under heavy impact load or a compressive load, it hardens from the surface while the base material remains tough. The depth and hardness of the work hardened surface vary depending on application and Mn steel grade. The work hardened layer can be 10 mm to 15 mm deep and hardness can be up to 560 HB in primary applications. The Mn/C ratio and the amount of chromium are also relevant for the desired wear resistance of these steels.